Type: "sudo apt-get install fceu". For those readers out there that recognize this, yes, this is "apt-get." XBMCBuntu is a full-fledged Ubuntu distro, so most anything you would install on vanilla Ubuntu is fair game here. Take that tidbit and run with it. 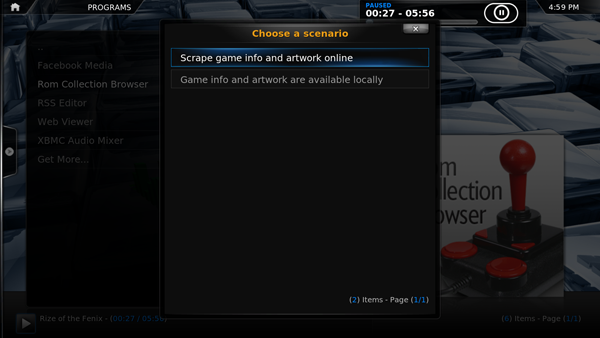 Next, type "exit" then press "ALT / CTRL / F7" together to get back to the XBMC GUI. Navigate over to "Programs" and, just like with the installation of Engadget video, click "Add-ons" followed by "Get more." What you want to choose here is the "ROM Collection Browser" option. Once the installation is complete, you'll once again see an "enabled" label confirming the setup went as expected. 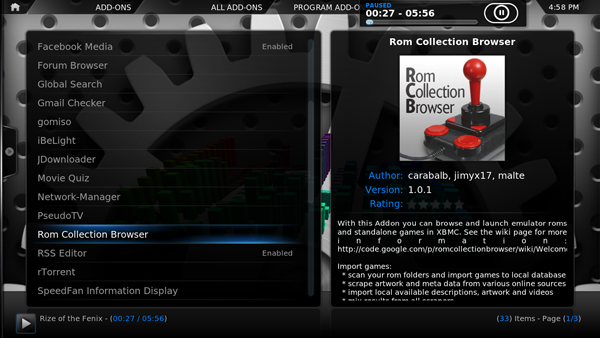 Navigate back to "Programs" and you'll see "Rom Collection Browser" listed. Press "Enter" on that, as we've still got a bit of configuration left to do. Select "Scrape game info and artwork online." 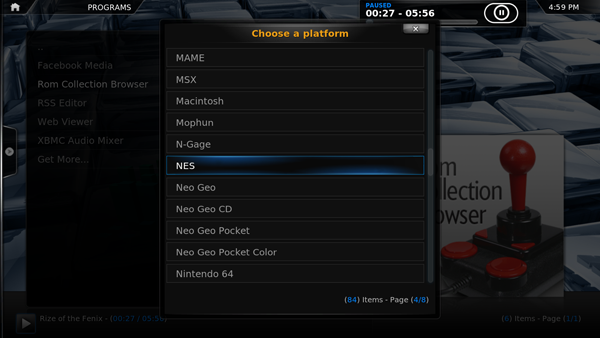 Then choose "NES" in the following dialog. 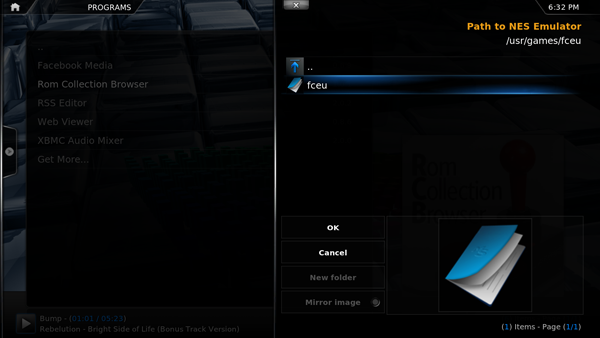 XBMC wants to know where the fceu emulator we just installed is located within the system. Navigate to Root filesystem > usr > games > fceu. Once selected, a new dialog will open asking for params. We do not need to modify anything in this window, so simply hit "Enter." Next up, we need to specify where those legal ROM backups are located. Choose the path where you SFTP'd them to. Once the appropriate path is selected, you need to select a file mask; in most cases it's probably a .zip file. Press "Done" and the ROM setup should be complete. Next, you'll be asked where your NES artwork will be stored. Just select "OK" here, as the default option is fine. Lastly, the add-on will kindly ask if you'd like to add another ROM collection. You can safely select "No" at this point. 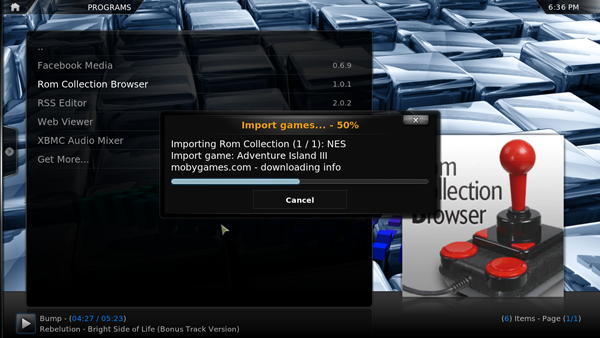 At the next dialog, select "Import" to complete the process. Work complete! 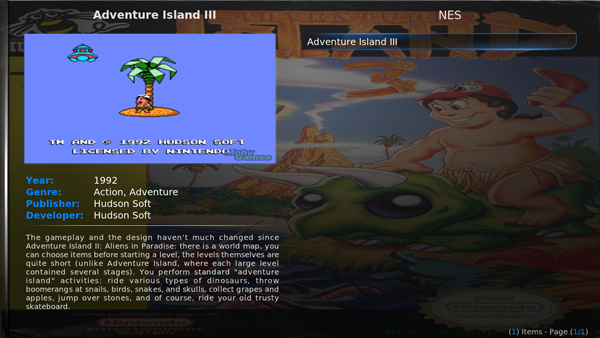 You can now select a ROM and play it on your big screen. At last, you're done with dialog boxes and settings tweaks for the time being; feel free to reward yourself with a little nostalgia trip, though we think you might want to grab something better than a keyboard. Wrapping this journey up, these post-configuration tips barely scratch the surface of the truly magical things you can do with XBMC. Keep tinkering and see just what's possible. There's no reason to hold back your geeky side -- after all, haven't you already built own media center device?